Chen H.-H., et al. (2004) J. Biol. Chem. 279:41404-41413Katagiri C, et al. (2011) Mol Cell Biochem. 352(1-2):155-62. Western blot analysis of DUSP13 in human skeletal muscle lysate in the 1 ) absence and 2 ) presence of immunizing peptide. 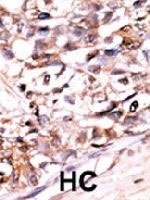 Using DUSP13 polyclonal antibody ( Cat # PAB0294 ) at 0.5 µg/ml. Western blot analysis of DUSP13 in human skeletal muscle lysate in the 1 ) absence and 2 ) presence of immunizing peptide. Using DUSP13 polyclonal antibody ( Cat # PAB0295 ) at 0.5 µg/ml. 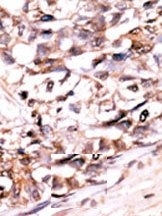 Formalin-fixed and paraffin-embedded human cancer tissue reacted with DUSP13 polyclonal antibody ( Cat # PAB4140 ) , which was peroxidase-conjugated to the secondary antibody, followed by AEC staining.This data demonstrates the use of this antibody for immunohistochemistry; clinical relevance has not been evaluated. The DUSP13 polyclonal antibody ( Cat # PAB4140 ) is used in Western blot to detect DUSP13 in human CEM cell lysate. Western blot analysis of DUSP13 (arrow) using DUSP13-M1 Antibody (N-term). 293 cell lysates (2 ug/lane) either nontransfected (Lane 1) or transiently transfected with the DUSP13 gene (Lane 2) (Origene Technologies).